A number of years ago, while still living in New York, I used to play a lot of golf. At one of the golf courses that I frequented, there was a large bird house setting on top of a metal pole, stabilized with guy wires and located just off the practice putting green. As you drove into the clubhouse, you had to drive right by this bird house and the practice green. I remember, during the summer, this house was literally mobbed with birds. Often, while practicing my putting, I would stop and watch them as they noisily chattered about, in what was an apparent continuing squabble. There were obviously more birds than there were holes. 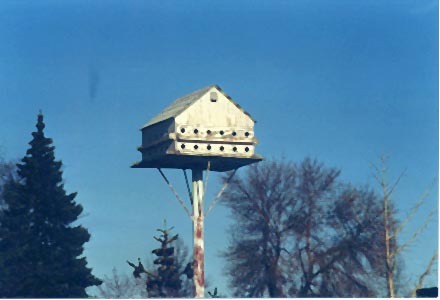 Now, I had bird houses at home, but nothing like this, and at that time in my life, I guess I had other things on my mind and keeping birds just wasn't one of them. Still, there were many times when I just stood and watched them, mesmerized at their beauty and ease of flight. I remember, if the wind was just right, they would face into it, and it seemed as though they could just float in one spot. The mobbing of the house also amazed me. Most birds in nature, when nesting, were seclusive and wanted to be away from other birds and especially, man. But, here were probably as many as 50 birds, that didn't seem to mind at all that I was standing in very close proximity to their house. This went against all the rules I had ever learned about nature. Nesting birds liked seclusion. Then one day, I happened to be at the golf course, and there was one of the attendants, standing on a ladder, obviously doing some kind of work in the house. Birds were everywhere, flying over the house, chattering away, I assumed about how their house was being broken into. I watched in amazement as he worked, and I noticed that the birds didn't dive-bomb him. Here he was, breaking into their nest and they just flew around and watched. This went on for at least ten minutes, then, he climbed down, took his ladder and returned to the course workshop. To my amazement, within minutes, all the birds were back as if nothing had ever happened. I had never seen anything like it before. Being a hunter and an outdoorsman, I thought I understood nature enough to know you don't disturb a birds nesting site or they will abandon it. But, being young, I guess I didn't give it much more thought. Then in 1985, I decided to make a change in my life, and moved my family south to Alabama, where I went to work for a company that designed and built computers. The engineering work wasn't that much different, but the geographical change was totally different. Winter as we knew it became nonexistent. Snow was now a treat, reminding us a little bit of home. There were some differences in the animals and birds, some old, but then again, many new. One thing that was very plentiful was Whitetail deer, and being a bow hunter, that was my life during hunting season. Often, I would drive the back roads to see if I could see any on the woods edge, and maybe take a picture or two. On this one particular beautiful summers day, I was riding down one of these back roads, enjoying the country side and nature, when I happened to notice a man struggling with a ladder and metal pole that was full of gourds. There were birds flying literally all around him. I had often seen these gourds hanging from poles and wires before, but it never really hit me just what they were for, or I guess it really never entered my head to question it. As I watched him work, it dawned on me. These were the same birds I had watched in the bird house while on the putting green back in New York. Obviously, they liked the gourds just as much as the house. I wondered then, what would possess a man to go through what apparently seemed like a lot of work just to keep some birds. As I drove on, I started noticing other houses and farms that had these gourds hanging all about. Some only had a few, while others had more, some hanging on wires, others on poles. I also notice that a number of the places had houses much like the one I used to watch on the putting green. Now my interest was beginning to peek. There must be something to this gourds and birds thing, and being of an inquisitive nature, I decided to investigate and find out just what this was all about. Now, I had heard of purple martins. But, what I didn't realize at the time, was that they were a very friendly bird and depended almost entirely on man for their housing. After digging a little deeper, I found that these birds needed man to supply them with housing, and that they actively searched out this housing, so they could propagate their species. Being a person that enjoys birds and nature in general, I decided to build a bird house for the martins to come and stay at my house. I acquired some plans, and, per the directions, I put up a pole, built, painted and placed a nice 12 room house on top of it, then sat back and waited. One, two three, four, five years went by without any success. Martins came, landed on the house, but would never stay. To say the least, I was getting very disappointed and wondered why. I built the house to the exact specifications as the plans had said. I put it at least 12' high. I located it out in the open, away from trees. I even kept the other birds from nesting in it. Then, one day, while discussing the situation with a friend of mine, he offered me some gourds and said to "try them", so, I decided I didn't have anything to lose and put them up. I built a metal pole with a 'tee' section at the top and hung 4 painted gourds from it. I then placed the pole about 20 feet from the original house. Bingo, the next spring, I had a pair of martins move in. I was ecstatic. Finally, I was going to get to watch these birds and see what the fascination about them, was all about. The pair moved into the end gourd, closest to the our house. I had a good clear view of the gourd and I was going to be able to watch the nest and find out what was so intriguing about them. Things were finally going to plan. But, disaster struck. One day I found the male on the ground behind my shop. He had obviously broken a wing and there was nothing I could do for him. I picked him up and gently placed him on the top of a post. He just stood there and watched me walk away. The next day I found him expired on the ground. The female, without the male, abandoned the nest. No more came to my gourds or house the rest of the summer. Another year would go by without my having martins. The following year, we got lucky again. A pair of martins moved into the exact same gourd that was used the previous year. All summer we took the time to be very careful not to do anything that would scare them away. A pair of sparrows moved into one of the other gourds, and I knew I had to remove them, but I couldn't figure out how to get up to them to get them out. They were too high for my step ladder, and I was afraid to bother the martins, so I just let them go and complete their nesting as long as they left the martins alone. I couldn't believe it. Finally, on my 7th year of trying, I had martins nesting near my home where I could watch nature at its best. And, enjoy them we did. Many evenings, we would sit and watch, as the adults brought insects to the eagerly waiting young. And their aerial acrobatics alone could mesmerize anyone who watched. The pair successfully raised two young martins that I happened to get to see the first flights of both. The first one was an absolute marvel to me. I just happened to be watching when the young bird took flight. The female hassled and chased the young bird. I couldn't figure it out. I mean, she literally scared the young bird into flight. What I didn't know then was that, that's how the parent birds made sure the young took flight and didn't land on the ground. I also didn't know that if the young did land on the ground, the parents would not come down to get them, therefore, they force the young birds to fly high into the air where they can practice their first flights. Two times I saw this pushing of the young birds to flight and wondered in amazement. At the time I thought, how strange. Obviously, there was a lot of things I didn't know about these birds. It was at that point that I decided I had a lot to learn and vowed that before the next season, I would know a lot more about what I was dealing with. I also vowed that the sparrows would not be allowed to nest in the martins gourds again. I knew of a few guys at work that 'kept' martins and asked them questions about what I needed to know for raising these birds. It was funny how each person I talked to, gave me a different opinion of what was required. I guess it's just like every other hobby, everybody has his own way of doing things along with his own opinions. One even scoffed at the idea of my using gourds for purple martins. Said "houses were the only way to go". At the time, my house still didn't have any martins in it, but my gourds did, so I didn't listen to him very much. At that time, I didn't know that I had to do any kind of nest checks. I also didn't know that I was supposed to be able to get at the gourds to clean out the pest birds. With that under my cap, I decided to design me a system that would allow me to easily get at my gourds to take care of them. After a little thought, I came up with something I was happy with and it really worked great to access the gourds. In fact, once I put it up to weather in the sun, I had neighbors come and ask me where I got it so they could get one. Since I had been told that my pole should be located in an open area on my lawn, I decided to move it to an area that was wide open and the birds could access it much easier. Now, I thought I was ready. This year I would see to it that the sparrows would not be allowed to nest in any of the gourds. I also had my gourds painted, cleaned and hung, ready and waiting for the martins to arrive. But, to my dismay, I was to be very surprised. The martins didn't like the fact that I had moved my pole. I had only moved it a few hundred feet, but that was too much, and they didn't come that year. I was devastated. The guys either hadn't given me all the information I needed to know about moving a martin site, or they themselves didn't know. I had done so much work to make everything just right for them, and they just ignored it. Again, I would go through another year without martins. I was beginning to wonder if it was all worth it. I had done just what people had told me to do, and the martins came, but wouldn't stay. At the end of summer, I grudgingly took down the gourds and put them away for the winter. I thought to myself, somewhere there had to be a source of information for people like me who where just starting out. Someone, somewhere must have written books or have some kind of literature available that a beginner could obtain, with information that is clear and concise, or at least tested, to make attracting these birds a lot easier. Obviously, hearsay from friends wasn't the way to get it. Everyone had different ideas or opinions, or they really didn't know what they were talking about, and I was paying for it the hard way, no martins were at my site. So, I made a vow to myself. I would obtain whatever information I could that would help me understand these birds and their nesting habits, and then maybe I could figure out how to properly attract them. The following spring, I replaced the gourds on their hangers and again, I waited. March came and went with no martins. April started out cold that year and the wind made it feel even colder. Then, on April 14th, a single solid black male martin showed up on my gourd pole. It stayed for about half an hour, then left and wasn't seen again that day. But the next day he was back and stayed for the next week all by himself. Each morning I could hear him chortling his song, and then he would lift himself on the morning thermals and be gone. Then, on a Saturday morning there were suddenly two martins, one of them having a mottled breast. A female. Maybe a pair. I knew from some of the information I had obtained, that it was early in the year and nesting was a ways off, but they did end up staying. They were there all alone for a whole week, when suddenly there were two pairs. Where they had come from, I didn't know, but I didn't ask any questions, I had purple martins staying on my gourd system and that's all I cared about. Spring was beautiful, and as it turned out, summer was to be even more beautiful. No sparrows or starlings dared nest in my gourds, less they felt my wrath of instantaneous eviction. I had never in my life been in a wild birds nest without them abandoning it. Oh, they raised cane, and let me know of their disapproval, but it was all a bluff. I had a total of three pairs of martins spend that summer in my gourds, but for some reason only two pair reared young. That almost didn't matter to me. Already these birds had proved to me that they were a strange lot, and it just meant that I had a lot more to learn. For now, they had accepted my gourds, located in a new location on my lawn, stayed and raised young. I was finally a 'martin landlord' and could talk to others of my experiences after my first year with more than one pair of martins. It was a great feeling. This time, as I took the gourds down at the end of summer, I thought about the past weeks. The evenings of sitting out on the back deck, watching the males diligently sitting on the cross arms of the gourd hangers, waiting on the females to hatch their young. And then, after the young had hatched, watching them, each in turn, fly away into the air, only to return and swoop into their holes with more and more insects to stuff into ever gapping young mouths. I thought of how proud I was to see young martins resting on my gourds after their first few flights. And, I thought of their return next spring when they come back, and bring their young and maybe a few friends. Yes, I thought about next spring. Oh, what a beautiful spring and summer it was going to be. Little did I know, just how much more beautiful the next few summers were going to be.